Economists view the United Kingdom as a small-open economy. In economists’ jargon it means that the UK is susceptible to foreign shocks, but that UK shocks do not influence other countries. This definitely was not the case in 2016. The result of the EU referendum, even though it was a UK-specific policy event, had a global impact. Our analysis shows that the Brexit vote not only had a significant impact on UK bond and equity markets, but also spilled over significantly to other advanced economies. Moreover, this approach suggests that the initial Brexit-shock has only partially reversed and still remains a drag on global bond yields and equity prices, though there are wide error bands around that conclusion. The Brexit-related shock – how shocking was it? The FT named the Brexit vote one of the events that shook financial markets in 2016, but how shocking was it? 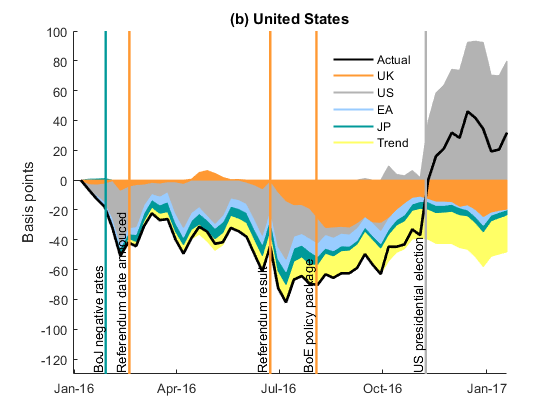 Based on newspaper coverage frequency, Baker, Bloom and Davis (2016) developed an Economic Policy Uncertainty (EPU) index that measures policy-related economic uncertainty. The UK EPU index shows that the Brexit vote not only lifted policy uncertainty to a record high, but it also pushed up the index to a level three times as high as the previous peak since the start of the sample in 1997 (Chart 1). At the same time, the global EPU index also spiked up, indicating that the Brexit-related shock might have had global consequences. We analyse how big the impact of the Brexit vote was on UK bond and equity markets and how large spillovers were to other countries. This is a non-trivial exercise since both bond yields and equity indices co-move closely across countries, making country-specific shocks hard to identify. In the following analysis, we use a relatively novel identification strategy – identification through heteroskedasticity (Rigobon, 2003) – to pin down the geographic origin of the underlying shocks. This identification strategy exploits the fact that asset prices exhibit time-varying volatilities. For each asset class, we estimate a Vector Auto-Regressive model, similar to Ehrmann and Fratzcsher (2017), one on weekly changes in yields and another on weekly returns on equity indices between 2001 and 2016. We identify two volatility regimes (high and low) using Markov-switching models for each country, see Lütkepohl and Netšunajev (2014). This allows us to back out the country’s probabilities of being in the high or low volatility regime for each week. These probabilities are used to date different volatility regimes which, in turn, are used to identify country-specific shocks in the Vector Auto-Regressive model. In addition, we allow data to follow a deterministic trend throughout the whole sample period. 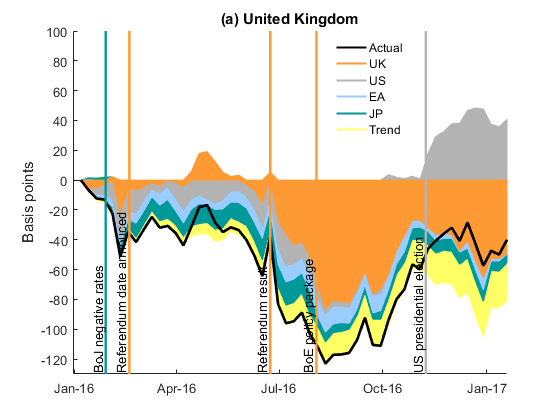 We use our models to decompose moves in 10-year government bond yields and equity prices of the UK, US, Euro area and Japan into country-specific shocks and a long-term trend since the beginning of 2016, from just before the announcement of the date of the EU referendum on 20 February 2016. 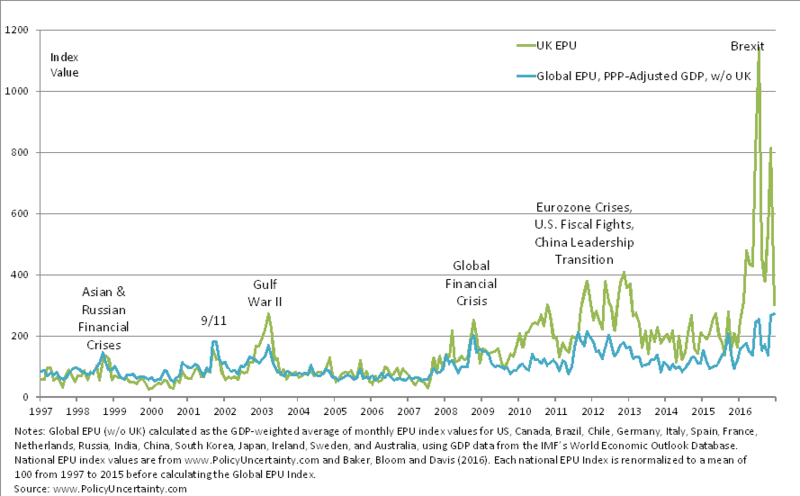 This allows us to understand how much UK-specific shocks drove UK and global asset prices. For example, the solid black line on Panel (a) of Chart 2 shows that by the end of 2016 UK yields were almost 60bps below levels noted in the beginning of 2016. 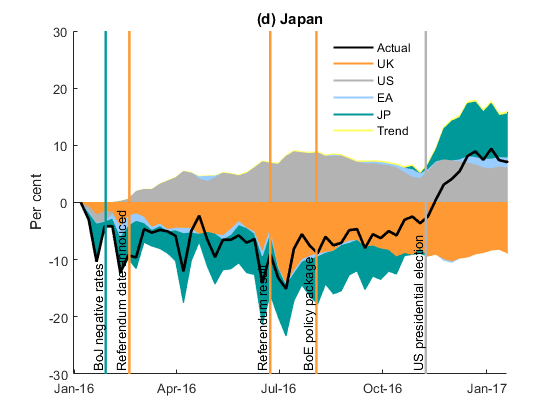 Our analysis suggests that the decline was predominantly driven by negative UK shocks (orange area) and only slightly by negative Euro area shocks (light blue area) and Japanese shocks (teal area). The drop in UK yields would have been larger if it had not been for US shocks driving yields up (grey area). Finally, all panels of Chart 2 show a negative long-term trend pushing each yield down. Panel (a) of Chart 2 shows that the announcement of the referendum on 20 February had no material impact on long-term bond yields, since we do not observe any negative UK-specific shock around that date. In fact, ahead of the referendum long-term sterling bond yields were predominantly driven by foreign shocks. This, however, is not the case for UK equities. Panel (a) of Chart 3 clearly shows some negative drag from UK-specific shocks to UK equities ahead of the referendum. In addition these shocks spilled over to other major equity markets and remained in place until the referendum – see Panels (b) to (d) of Chart 3. The big UK-specific shock hit financial markets on 24 June, when the surprising referendum result was revealed (Bloomberg news). 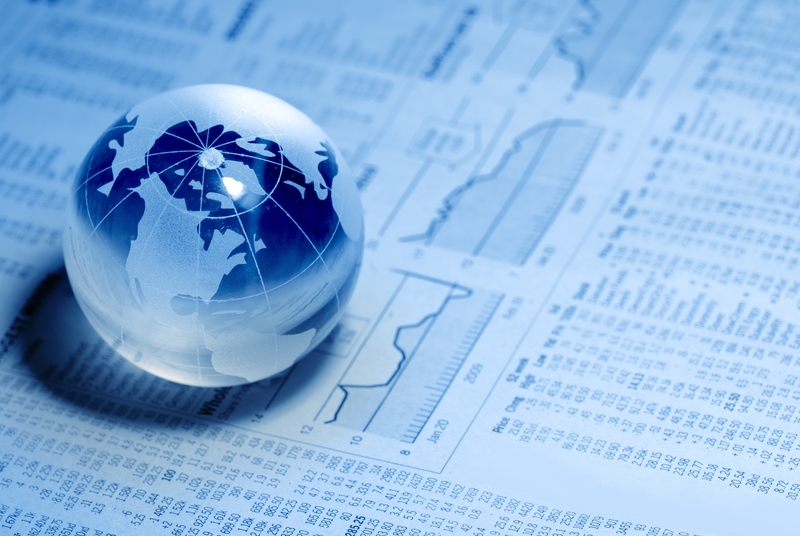 Global markets responded quickly by selling off risky assets (equities) and demanding safer assets (bonds), which led to falling equity prices and bond yields respectively. UK-focused equities fell – in the period of two weeks from the referendum to its trough – by 17%. Not surprisingly our model assigns all of that fall to a UK-specific shock, and in fact implies that the falls would have been even deeper if not for a small upward US-shock. Panels (b) to (d) of Chart 3 show that the negative UK-specific shock (orange area) spilled over to other markets leading to drops in global equity prices. But this response was not equal across the globe, since different markets have different sensitivities to UK-specific shocks. For instance, US-yields exhibit the highest sensitivity to UK-specific shocks, while Japanese yields exhibit the lowest. In the two week period of sharp UK-equity falls, UK bond yields fell by almost 60bps. But this trend continued for another five weeks, pushing down UK-yields by another 30bps to a record low of 0.6% (see Panel (a) of Chart 2). The fall in yields can be potentially explained by the expected and subsequently realized Bank of England (BoE) monetary policy package. 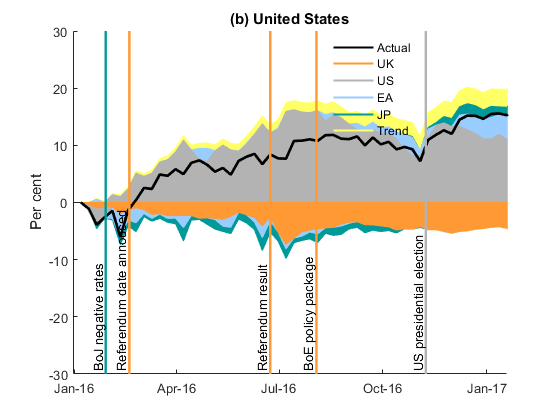 The package (consisting of a decrease in Bank Rate, a new Term Funding Scheme, the purchase of corporate bonds and the expansion of government bond purchases) may have contributed to the compression of long-term bond yields and impacted other assets. In addition, our algorithm suggests that the compression of yields spilled over to other global markets (see orange areas in Panels (b) to (d) of Chart 2), especially to US yields. 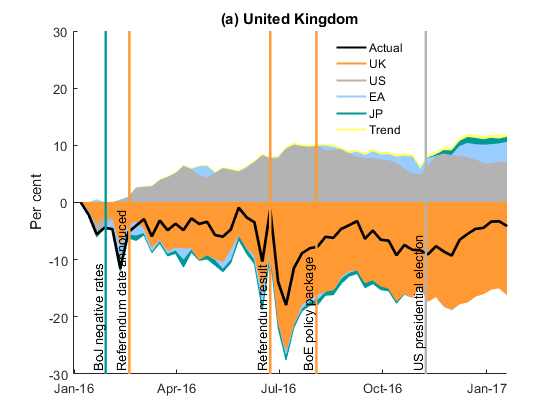 Our model shows that around two-thirds of the initial negative shock to UK-equities reversed around the BoE monetary policy package (see Panel (a) of Chart 3). 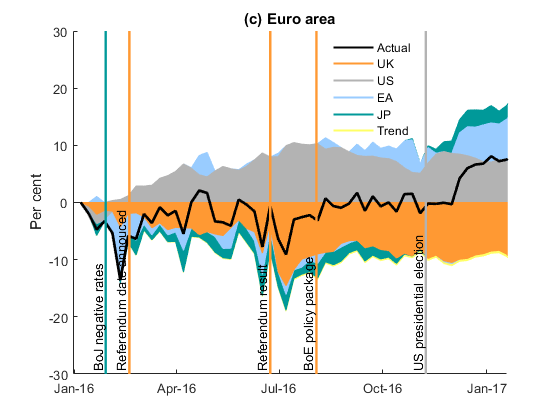 This apparent reversion of the UK-specific shock (orange area) also spilled over globally and had the most significant impact on euro area equities. Throughout the rest of the year UK-specific shocks to bond and equity markets were shaped partially by upside economic surprises (e.g. better than expected GDP growth) and partially by the soft vs. hard Brexit debate. The impact of the surprise outcome of the EU referendum still remains a negative drag on UK long-term rates as well as on UK equity prices. In addition, as can be noted from Panels (b)–(d) of Charts 2 and 3, spillovers of the Brexit-related shock remain a significant drag on global yields and equity prices. For example, US long-term bond yields would have been around 25bps higher in January 2017 if not for the remaining negative UK-specific shock. Of course the EU referendum and its aftermath were not the only significant shocks to global asset prices in 2016. For example, market prices reacted to the surprise outturn of the US presidential election and to the introduction of negative rates in Japan. Panel (b) in Charts 2 and 3 indicate that the US election result posed a big upward US-specific shock on both long-term yields and equities. This shock spilled over significantly to other economies, which is not surprising as global markets (with the exception of Japan) are historically very sensitive to US-specific shocks. 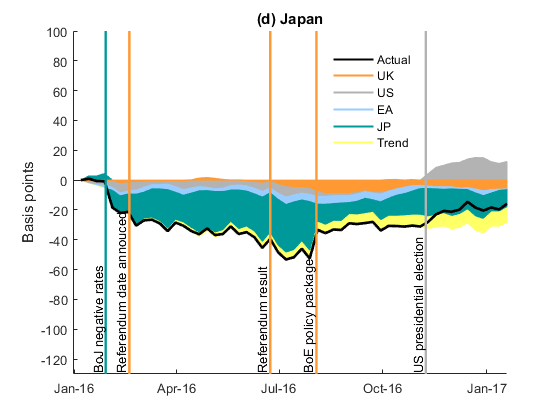 In contrast, Japanese shocks, such as the introduction of the negative interest rate, spilled over only marginally to other countries as historically global markets are relatively immune to Japan-specific shocks. 2016 was the year when UK-specific shocks, in particular the EU referendum, influenced global bond yields and equity prices. The effects of these shocks have only partially unwound and still pose a drag on UK and global yields and equity prices. Marek Raczko, Mo Wazzi and Wen Yan work in the Bank’s Macro-Financial Analysis Division. Next Post Has there been a sea change in the way banks respond to capital requirements? The authors characterise the UK as a small-open economy and write as follows: “In economists’ jargon it means that the UK is susceptible to foreign shocks, but that UK shocks do not influence other countries”. Maybe so, but also maybe that jargon needs to be supplemented, if not replaced by different jargon. Part of what is at issue here is the signalling of a certain type of political risk across countries and regions. Brexit poses the question of whether similar policies might gain traction elsewhere (which indeed they have done). The mechanism is political as much as economic. There is a colloquial term for this: cold feet. Markets move in waves and social mood. Too often events and news are used to explain markets. FTSE and European MKTS have either put in their highs or will and begin their long decline which will last several years and will decline below their 2008/9 lows. Bonds for many corporations and even governments will see significant losses and some, if not many, will go to zero, reflecting risk and the ability to pay. Interest rates will rise, refer to 1929 to 32, as an example of interest rate rise and etc. 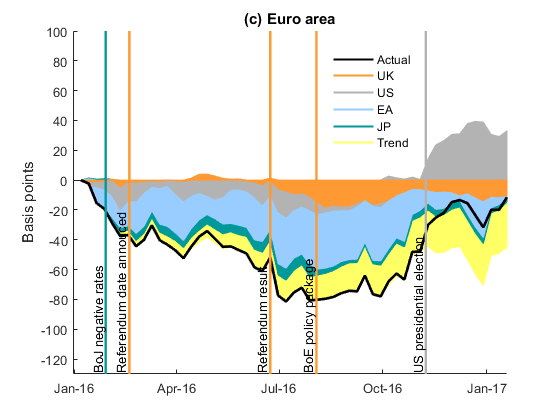 How to interpret the finding that the EA-specific shock has very little role in explaining all the bond yields and equity prices (apart from EA bond yields) in this exercise? Is it because we did not experience EA-specific shock in 2016? In addition, what did you consider for EA bond yields, only German bund yield or a weighted average of eurozone bond yields?